I have had these cookies on my very long "to bake" list for at least a year, and was so happy to finally make them. It was kind of nice to have a "decorated" cookie without whipping up a batch of icing. No sugar overload (Is there such a thing?) here, just chewy, chocolatey-ginger goodness! This is a Martha Stewart recipe, which was described as crisp, but mine turned out as a soft cookie, which I prefer. We really enjoyed these cookies, and I'm sure you will too! The chocolate/ginger combination was just right, and perfect for fall! 1.Preheat oven to 325 degrees. Line two baking sheets with parchment paper; set aside. Whisk together flour, cocoa, spices, salt, baking powder, and baking soda. 2.Cream butter and brown sugar on medium speed in the bowl of an electric mixer fitted with the paddle attachment until pale and fluffy, about 4 minutes. Add egg, molasses; mix until combined. Add flour mixture; mix on low speed until just combined. 3.Halve dough; flatten into two disks. Wrap in plastic wrap; refrigerate 1 hour. Transfer disks, one at a time, to a lightly floured surface; roll out to 1/4 inch thick. (If dough gets soft, freeze until firm.) Use cookie cutters to make shapes; place 1 inch apart on sheets. Refrigerate until firm, about 20 minutes. 4.Score designs with a knife; sprinkle with sanding sugar. Bake, rotating sheets halfway through, until cookies are firm, 11 to 13 minutes. Let cool on a wire rack. These are so festive, and what a great flavor combination! I love your blog. ;) The cookies look yummy. I have seen this recipe in my MS cookie book and keep saying I have to make them. I think now I will. i love these! 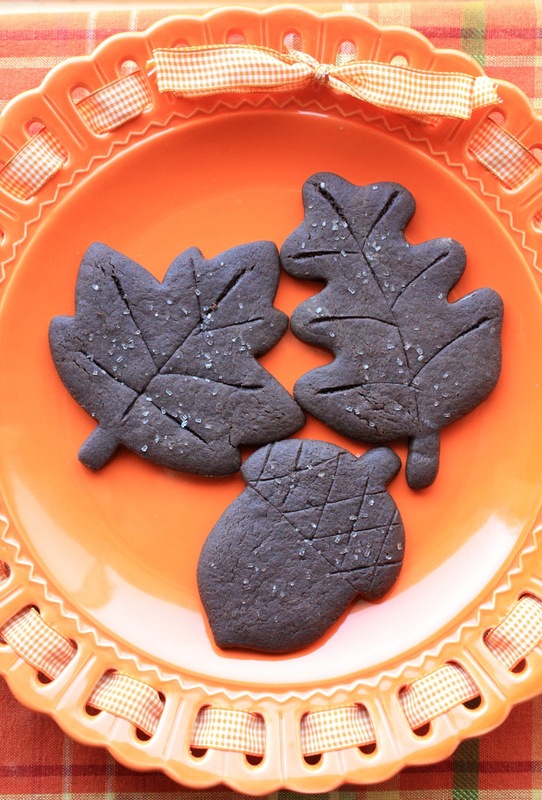 i have so many MS recipes on my list...love the simplicity of your chocolate leaves! Love them, they look perfect. They sound wonderful and look great! Nice job! I don't think I have ever tried chocolate ad ginger together, but it looks and sounds really good! Just found your blog and I have really been enjoying it!! So pretty... love these cookies! boy do these sound lovely to taste and so lovely to look at! Perfect for a tea party I think!! these are so cute, perfect for the fall!! thanks for sharing! These are really elegant Sue and I would love the ginger in them. I believe and have said it for some time now that ginger has something addictive in it, at least for my taste buds! I can't stop when I am eating ginger cookies. We will have to put this on our to try list too. With Pinterest, I am sure we are going to gain a lot of weight as we keep setting aside more and more luscious recipes! This looks like one of them. Just by looking at them, I can see the Christmas spirit! :D Hubby would go crazy for these I think! Yum...Chocolate and ginger go so well together and your cookies look lovely. Love all the details you all on them. :) Just as pretty even without icing. Absolutey beautiful cookies, Sue. I love that they're not too sweet, which enhances the cocoa, ginger and molasses. The sugar topping look like flecks of fresh, falling snow. Dare I say these look better than Martha's? What lovely looking cookies. I'm sure I'd enjoy that chocolate ginger combo too. Thanks for linking them up to Sweets for a Saturday. ohhhh...those cookies look so beautiful, Sue! I love the flavor combination and their fall shapes!! !